Since the beginning, Lucas was heavily involved in different projects for the expansion of electronic music culture in the state of Sao Paulo. His hard work leading projects like Club Play, Kraft Club and Rave Techardia put the city of Campinas on the map of the electronic scene. He has been a resident dj at A Loca Club, Lov.e Club & Lounge and Kraft Club. 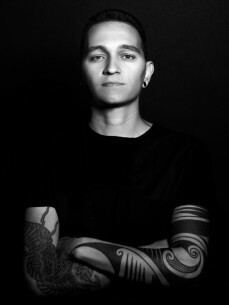 His strong participation in many projects, focused in the consolidation of electronic music scene in his country, brought him even more respect beyond his DJ skills. His international renown started in 2004, when DJ Rush (USA) invite him to take part in one of his European tours. As expected, the European public acceptance was fantastic and Lucas spent the following 2 years traveling to play in some of the most import clubs and festivals in Europe. Since 2007 Lucas lives in Barcelona, Spain. During almost 15 years of career, Lucas has played in more than 30 countries and has released more than 100 tracks in several record labels. He is known for his unique technique in the mix – some say near perfection - and for the big energy and the good vibes he transmits when he is on stage. Catch Lucas Freire live at InDeep’n’Dance Records Store Rozengracht 60.